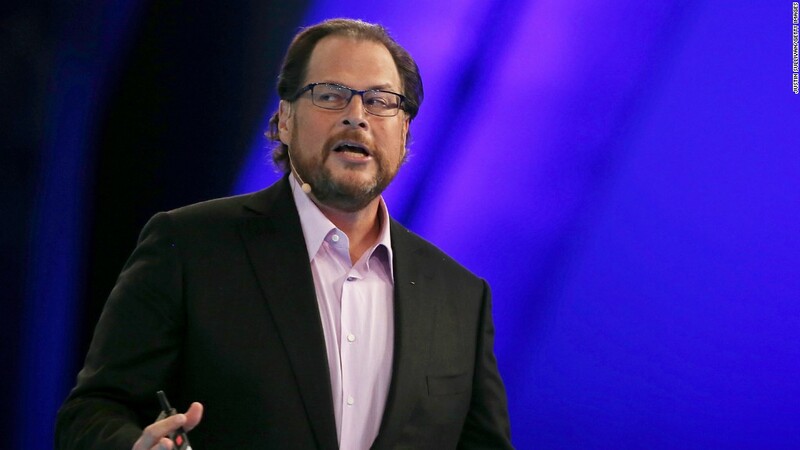 Salesforce CEO Marc Benioff is helping employees who are uncomfortable with Indiana's controversial religious freedom law to transfer out of the state. Benioff told CNN's Poppy Harlow on Wednesday that several employees have asked for transfers -- and he has agreed, even supplying relocation packages. "I just got an email on the way to studio from another employee who said, 'look I don't feel comfortable living in this state anymore, you have to move me out,' and I gave him a $50,000 relocation package and said, 'great, you're clear to go.' "
Benioff acknowledged that Salesforce (CRM) won't be able to completely pull out of Indiana, given the size of the company's operations there. But the company is helping individual employees who feel oppressed to leave. The move is in response to a law signed last week by Indiana Gov. Mike Pence that allows businesses to refuse service to gay, lesbian and transgender people on religious grounds. Benioff had already pledged to reduce his company's investments in Indiana, calling the law "brutal," "unfair" and "unjust." The cloud computing CEO said he is working with state officials in hopes of changing the statute. Moving employees out of the state is a new step, however, and one of the most aggressive corporate actions taken in response to the new law. Related: Is the GOP losing Walmart? Big business has been at the forefront of the backlash against the Indiana law, and similar legislation pending in states around the U.S.
Apple (AAPL), Yelp (YELP), the NCAA, Eli Lilly (LLY), NASCAR, General Electric (GE), Angie's List and PayPal are among the companies that have raised concerns. Leaders from some 39 tech companies and organizations have also condemned the legislation. "This is a really important point that, you know, CEOs have a lot of power and control on investment in states and we want to invest in states where there is equality," Benioff said. "One thing that you're seeing is that there is a third [political] party emerging in this country, which is the party of CEOs," he said.